The presented work proposes specific roles for the two mitochondrial Ca2+ uptake pathways: CU in Ca2+buffering, and RTC in cardiac metabolism. Cardiac mitochondria play a crucial role in buffering and shaping cytosolic Ca2+ oscillations. They also meet the beat-to-beat energy demand of the heart by Ca2+-dependent stimulation of mitochondrial dehydrogenases (e.g, pyruvate dehydrogenase, α-ketoglutarate dehydrogenase etc.). To date, a number of Ca2+ uptake pathways have been identified with the Ca2+ uniporter (CU) positioned as the major player. However, an important question: Is the CU the major Ca2+ uptake pathway under physiological conditions? Likely not, since physiological concentration of cytosolic Mg2+ potently inhibits the CU. Our modeling analysis (present work) suggests likewise and identifies an additional uptake pathway with characteristics similar to the ryanodine receptor (termed as RyR-type channel or RTC). Current work also identifies/validates the existence of two protein classes which have roles as major mitochondrial Ca2+ buffers. The model analysis also suggests that these buffers auto-regulate their Ca2+ buffering capacity depending upon the pathway of Ca2+ uptake, i.e. CU vs RTC. The presented work proposes specific roles for the two mitochondrial Ca2+ uptake pathways: CU in Ca2+buffering, and RTC in cardiac metabolism. Future experiments should be designed to test this hypothesis. If true it will lead to development of specific therapeutic interventions targeting heart failure diseases associated with diastolic dysfunction and myocardial workload. 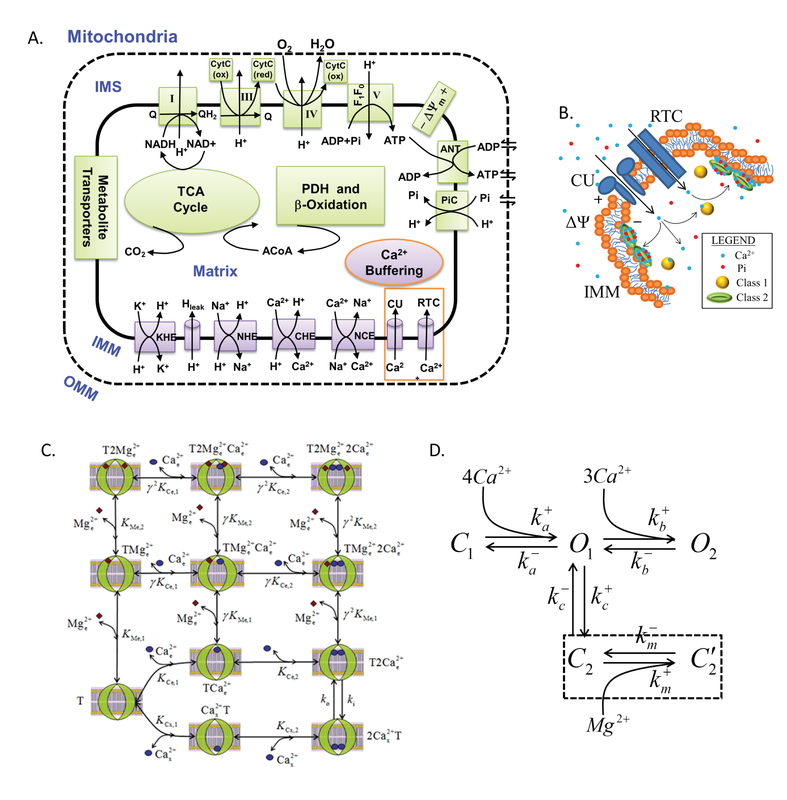 (A) Schematic diagram of the integrated model of mitochondrial bioenergetics and Ca2+ handling of Bazil et al. (2013) with the revised CU model and an additional RTC model (highlighted with an orange box). (B) Mitochondrial Ca2+ sequestration system depicting how Ca2+ is differentially buffered depending on how it is taken up by the mitochondria (see arrows). (C) Modified CU model to have Mg2+ inhibition of the CU to occur only at the cytosolic side. (D) Keizer-Levine model of cardiac RyR modified to include modulation of the RTC with adaption to account for effects by buffer Mg2+. The dotted box represents Mg2+ binding with the C2 state that is assumed to be in rapid-equilibrium.